I have been asked to write about my favourite photograph in conjunction with a talk in early September. This must be one of the most difficult editing processes for a photographer. The decision will change on a daily basis, depending on current projects, work and new ideas that have found space in a notebook. I think the closest I can ever get is one of my favourites. So a few thoughts. Pinhole Impressions 3 was taken in the winter of 2007. It was part of a series included in the International Garden Photographer of the Year competition in 2008, which was awarded second place in the portfolio category. As this was the inaugural IGPOTY competition, I still have fond memories of taking the photographs and the process leading to the awards. I always get asked two questions when this image is on display. The first is, “how long did it take in Photoshop to blur the clouds?”. The second is, “how long did it take to sweep the leaves into a perfect circle?”. The answer to both questions is no time at all. With any location photography there is always a certain element of luck. And with experience, you create your own luck. You can’t always predict what will happen, but you know something special will. So you wait. Gale force winds hit RHS Wisley on this particular day. 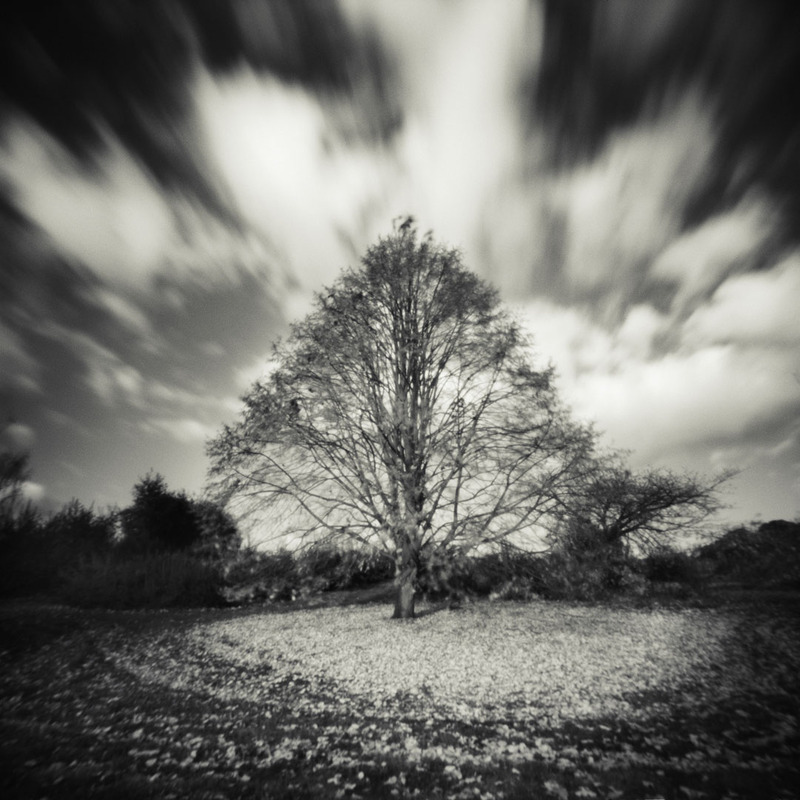 I was experimenting with Zero 2000 pinhole camera and was about to give up, as the wind was buffeting the camera and tripod. With exposure times of 10 to 15 seconds, this was a problem. But the movement of the clouds grabbed my attention, and I knew there was a chance of capturing something interesting. When I set the camera up, the tree was covered in leaves, but with the severity of the wind, it was stripped in 20 minutes. Instant ‘Land Art’ in the style of Andy Goldsworthy, but completely natural. As I was shooting film, I had no idea how good (or bad) the image might be, but I had a gut feeling something had happened. In the space of around 90 minutes, I took 5 rolls of film at other locations around Wisley, and this formed a large part the ‘Pinhole Impressions’ series. It’s rare that you have this kind of luck.